Filip Florian was born in 1968 in Bucharest, where he still lives today. Following his studies in Geology and Geophysics he worked as a journalist for the journal »Cuvintul«, and later for Radio Free Europe and Deutsche Welle. 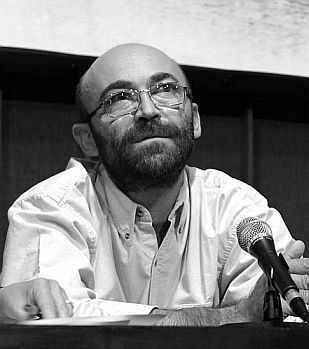 He spent five years in the Carpathian mountain resort Sinaia while writing his first, award-winning novel »Degete mici« (2005, Engl: Little Fingers, 2009), which has by now been translated into eight languages. His début is about experiences with the dictatorship in his country: in the course of excavating a Roman Castrum near a small Carpathian town a mass grave is discovered. The initial suspects are the Securitate – the bones of the little finger are missing from several of the skeletons. Petrus, the novel’s protagonist – an archaeologist who is plagued by stomach ulcers – is forced to delay his excavations, and observes the investigations in the little provincial town. He gets to know Aunt Paulina, who – uninvited – initiates him in the mysteries of fortune-telling using coffee grounds, as well as a businessman who had been dispossessed following the war, and now catches pigeons in his attic apartment and cooks them in white wine sauce. Petrus hears the story of the monk Gherghe, who had been persecuted by the Communists and who never removed his hat, but who had to cut his hair several times a day because it would otherwise grow within hours into a wild mane. With the help of an expert group of Argentinian anthropologists, who had solved crimes committed by the Junta in their country, it is finally possible to identify the dead as victims of a plague epidemic from around the year 1800. Filip Florian’s last novel, »Zilele regelui« (tr: The Days of the King), was published in Romania in 2008, and was selected as book of the year by the Colloquium of the Contemporary Romanian Novel.